Lutheran Women's Missionary League (LWML) is the official women's auxiliary of the Lutheran Church-Missouri Synod. All women of Immanuel are members and are invited to attend regular meetings on the fourth Tuesday of every other month. LWML is primarily a mission organization engaged in mission-oriented activities. One of our activities is the Quilting ministry that meets every Wednesday morning at 9:00 in Immanuel's Parish Hall. All are invited, no experience is necessary. We also collect used postage stamps which are sold to a collector; sums received are donated to an ethnic ministry in our district. Membership meetings: 4th Tuesday, every other month at 7:00 p.m. in Immanuel's Parish Hall. 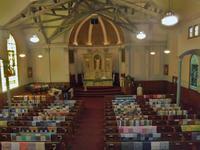 Quilting ministry meetings: Wednesdays at 9:00 a.m. in Immanuel's Parish Hall.